Do you know the story of your t-shirt? Whether you are a guy or a girl, you must have already worn and thrown lots of t-shirts by now. But do you know where and how your t-shirts are made? Or have you ever wondered about this? China. You must have said. It is ,in a way, true. Almost everything is made in China these days.But wait, there is more to it. Kudos to the globalization, a thing as simple as a t-shirt which we take for granted, travels halfway through the world before it comes into being. It's travel is not only complicated but very interesting and insightful as well. Most probably, the cotton of your t-shirt was grown in Lubbock county, USA. Then, it was shipped to China where young Chinese girls gave it the shape of a t-shirt and then it traveled all over the world. Some of them which landed in USA then further traveled to Africa, Japan and who knows may be Nepal too, once they were discarded by their original user. 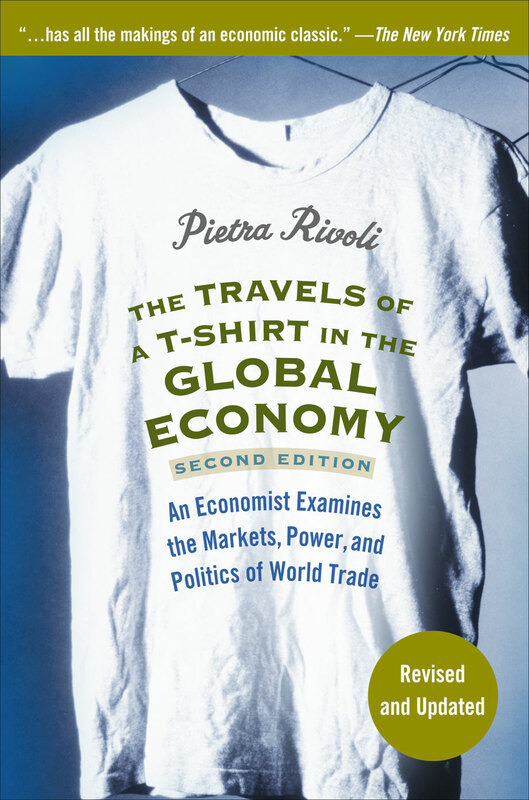 I recently (in fact, it was two months ago) finished reading a book called The Travels of a T-Shirt in the Global Economy: An Economist Examines the Markets, Power, and Politics of World Trade by Peitra Rivoli an economics professor at Georgetown University. She was inspired to embark on this quest when she witnessed students' anti-WTO, anti-globalization protests at her university in 1999. One of the student leaders had shouted in the microphone "Who made your t-shirt?". Rivoli was intrigued to find out the answer. In the book, she has traced the story of the t-shirt from its birth to death. She finds out that majority of the cotton used to make t-shirts around the world is grown in the USA and it has been the way for more than 200 years now. The dominance of USA in cotton industry is in part due to the subsidy it provides to its farmers but more important that the subsidy is the virtuous cycle created by the government, universities, corporations and farmers working together. The virtuous cycle ,which is missing in other cotton producing countries like India and Bangladesh, gives a competitive edge to American farmers that even subsidy could not give. She finds out that although sweatshops seem to be exploiting women and helpless, they are in fact emancipating women from drudgery of farm life and subjugation under male members of the family in their rural homes. She also finds out that it is not the free market but lack of free market that has been hampering the well-being of the poor people who are involved in the t-shirt business. She also finds out that, although doomsayers of globalization have been misguided to a certain extent, they have surely helped raise the working conditions at sweat shops through advocacy. She also discusses about the hypocrisy of the US government regarding free trade. Contrary to their rhetoric of free trade, the politicians out of their self-interest (votes from manufacturing industry) have erected too many trade barriers for the garments produced outside US. But still, the barriers are becoming meaningless as more and more manufacturing factories are shutting down. 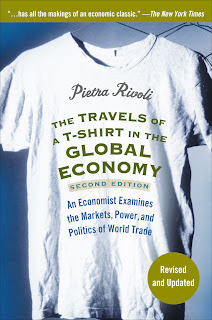 Interestingly, Rivoli discovers that the T-shirt that struggles throughout its life to find a free market, finally finds a free market once it is discarded by its original user. After being discarded by American consumers, the t-shirt travels to countries like Japan, Tanzania and other various countries where it is bought and sold in a truly free market. Damn, I almost told the whole story. Still, I highly recommend you to read the book. It is an amazing read, insightful and informative for both globalization supporters and globalization haters. Happy reading! !